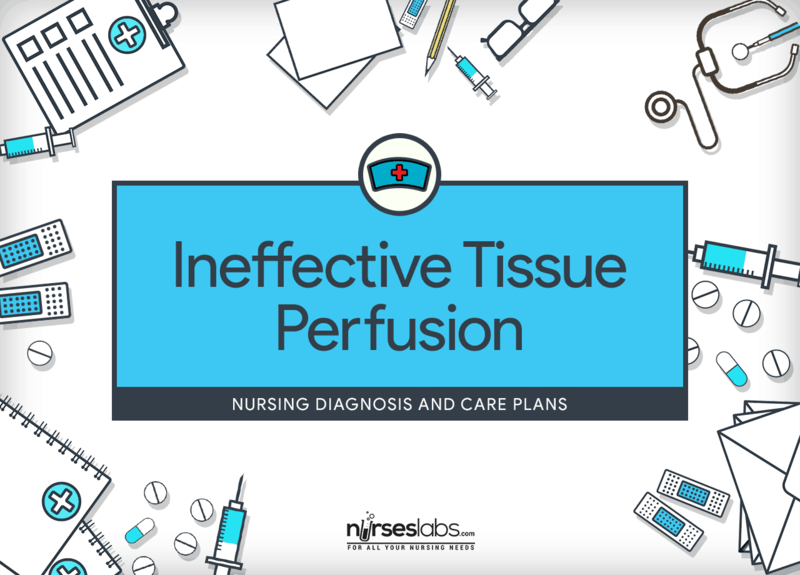 Nursing care plans and diagnosis for ineffective tissue perfusion. Ineffective Tissue Perfusion: Decrease in oxygen, resulting in failure to nourish tissues at capillary level. Blood is a connective tissue comprised of a liquid extracellular matrix termed as blood plasma which dissolves and suspends multiple cells and cell fragments. It carries oxygen from the lungs and nutrients from the gastrointestinal tract. The oxygen and nutrients subsequently diffuse from the blood into the interstitial fluid and then into the body cells. Insufficient arterial blood flow causes decreased nutrition and oxygenation at the cellular level. Decreased tissue perfusion can be temporary, with few or minimal consequences to the health of the patient, or it can be more acute or protracted, with potentially destructive effects on the patient. When diminished tissue perfusion becomes chronic, it can result in tissue or organ damage or death. Nursing care planning and management for Ineffective Tissue Perfusion is directed at removing vasoconstricting factors, improving peripheral blood flow, reducing metabolic demands on the body, patient’s participation and understanding the disease process and its treatment, and preventing complications. The following are the common goals and expected outcomes for Ineffective Tissue Perfusion nursing diagnosis. Patient identifies factors that improve circulation. Patient identifies necessary lifestyle changes. Patient exhibits growing tolerance to activity. Patient shows no further worsening/repetition of deficits. Patient engages in behaviors or actions to improve tissue perfusion. Patient maintains maximum tissue perfusion to vital organs, as evidenced by warm and dry skin, present and strong peripheral pulses, vitals within patient’s normal range, balanced I&O, absence edema, normal ABGs, alert LOC, and absence of chest pain. Patient verbalizes or demonstrates normal sensations and movement as appropriate. Regular assessment is required in order to identify possible problems that may have lead to Ineffective Tissue Perfusion as well as name any situation that may happen during nursing care. Here are some assessment cues you may need for creating a nursing care plan (NCP) for Ineffective Tissue Perfusion. Assess for signs of decreased tissue perfusion. Particular clusters of signs and symptoms occur with differing causes. Evaluation of Ineffective Tissue Perfusion defining characteristics provides a baseline for future comparison. Assess for probable contributing factors related to temporarily impaired arterial blood flow. Some examples include compartment syndrome, constricting cast, embolism, indwelling arterial catheters, positioning, thrombus, and vasospasm. Early detection of the source facilitates quick, effective management. Review laboratory data (ABGs, BUN, creatinine, electrolytes, international normalized ratio, and prothrombin time or partial thromboplastin time) if anticoagulants are utilized for treatment. Blood clotting studies are being used to conclude or make sure that clotting factors stay within therapeutic levels. Gauges of organ perfusion or function. Irregularities in coagulation may occur as an effect of therapeutic measures. Check respirations and absence of work of breathing. Cardiac pump malfunction and/or ischemic pain may result in respiratory distress. Nevertheless, abrupt or continuous dyspnea may signify thromboembolic pulmonary complications. Check rapid changes or continued shifts in mental status. Electrolyte/acid-base variations, hypoxia, and systemic emboli influence cerebral perfusion. In addition, it is directly related to cardiac output. Record BP readings for orthostatic changes (drop of 20 mm Hg systolic BP or 10 mm Hg diastolic BP with position changes). Stable BP is needed to keep sufficient tissue perfusion. Medication effects such as altered autonomic control, decompensated heart failure, reduced fluid volume, and vasodilation are among many factors potentially jeopardizing optimal BP. Monitor higher functions, as well as speech, if patient is alert. Indicators of location or degree of cerebral circulation or perfusion are alteration in cognition and speech content. Examine GI function, noting anorexia, decreased or absent bowel sounds, nausea or vomiting, abdominal distension, and constipation. Decreased blood flow to mesentery can turn out to GI dysfunction, loss of peristalsis, for example. Problems may be potentiated or provoked by utilization of analgesics, diminished activity, and dietary changes. Use pulse oximetry to monitor oxygen saturation and pulse rate. Pulse oximetry is a useful tool to detect changes in oxygenation. Check Hgb levels Low levels reduce the uptake of oxygen at the alveolar-capillary membrane and oxygen delivery to the tissues. Monitor intake, observe changes in urine output. Record urine specific gravity as necessary. Reduced intake or unrelenting nausea may consequence in lowered circulating volume, which negatively affects perfusion and organ function. Hydration status and renal function are revealed by specific gravity measurements. Submit patient to diagnostic testing as indicated. A variety of tests are available depending on the cause of the impaired tissue perfusion. Angiograms, Doppler flow studies, segmental limb pressure measurement such as ankle-brachial index (ABI), and vascular stress testing are examples of these tests. Check for optimal fluid balance. Administer IV fluids as ordered. Sufficient fluid intake maintains adequate filling pressures and optimizes cardiac output needed for tissue perfusion. Note urine output. Reduce renal perfusion may take place due to vascular occlusion. Maintain optimal cardiac output. This ensures adequate perfusion of vital organs. Consider the need for potential embolectomy, heparinization, vasodilator therapy, thrombolytic therapy, and fluid rescue. These facilitate perfusion when interference to blood flow transpires or when perfusion has gone down to such a serious level leading to ischemic damage. Administer nitroglycerin (NTG) sublingually for complaints of angina. This enhances myocardial perfusion. Maintain oxygen therapy as ordered. To enhance myocardial perfusion. When patient experiences dizziness due to orthostatic hypotension when getting up, educate methods to decrease dizziness, such as remaining seated for several minutes before standing, flexing feet upward several times while seated, rising slowly, sitting down immediately if feeling dizzy, and trying to have someone present when standing. Orthostatic hypotension results in temporary decreased cerebral perfusion. Check mental status; perform a neurological examination. Review trend in level of consciousness (LOC) and possibility for increased ICP and is helpful in deciding location, extent and development/resolution or central nervous system (CNS) damage. If ICP is increased, elevate head of bed 30 to 45 degrees. This promotes venous outflow from brain and helps reduce pressure. Avoid measures that may trigger increased ICP such as coughing, vomiting, straining at stool, neck in flexion, head flat, or bearing down. These will further reduce cerebral blood flow. Administer anticonvulsants as needed. These reduce risk of seizure which may result from cerebral edema or ischemia. Control environmental temperature as necessary. Perform tepid sponge bath when fever occurs. Fever may be a sign of damage to hypothalamus. Fever and shivering can further increase ICP. Evaluate eye opening. Establishes arousal ability or level of consciousness. Evaluate motor reaction to simple commands, noting purposeful and nonpurposeful movement. Document limb movement and note right and left sides individually. Measures overall awareness and capacity to react to external stimuli, and best signifies condition of consciousness in the patient whose eyes are closed due to trauma or who is aphasic. Consciousness and involuntary movement are incorporated if patient can both take hold of and let go of the tester’s hand or grasp two fingers on command. Purposeful movement can comprise of grimacing or withdrawing from painful stimuli. Other movements (posturing and abnormal flexion of extremities) usually specify disperse cortical damage. Absence of spontaneous movement on one side of the body signifies damage to the motor tracts in the opposite cerebral hemisphere. Evaluate verbal reaction. Observe if patient is oriented to person, place and time; or is confused; uses inappropriate words or phrases that make little sense. Measures appropriateness of speech content and level of consciousness. If minimum damage has taken place in the cerebral cortex, patient may be stimulated by verbal stimuli but may show drowsy or uncooperative. More broad damage to the cerebral cortex may be manifested by slow reaction to commands, lapsing into sleep when not aroused, disorientation, and stupor. Injury to midbrain , pons, and medulla is evidenced by lack of appropriate reactions to stimuli. Provide rest periods between care activities and prevent duration of procedures. Constant activity can further increase ICP by creating a cumulative stimulant effect. Reorient to environment as needed. Decreased cerebral blood flow or cerebral edema may result in changes in the LOC. Assist with position changes. Gently repositioning patient from a supine to sitting/standing position can reduce the risk for orthostatic BP changes. Older patients are more susceptible to such drops of pressure with position changes. Promote active/passive ROM exercises. Exercise prevents venous stasis and further circulatory compromise. Administer medications as prescribed to treat underlying problem. Note the response. These medications facilitate perfusion for most causes of impairment. These reduce blood viscosity and coagulation. These enhance arterial dilation and improve peripheral blood flow. These reduce systemic vascular resistance and optimize cardiac output and perfusion. Provide oxygen therapy as necessary. This saturates circulating hemoglobin and augments the efficiency of blood that is reaching the ischemic tissues. Position patient properly in a semi-Fowler’s to high-Fowler’s as tolerated. Upright positioning promotes improved alveolar gas exchange. Monitor peripheral pulses. Check for loss of pulses with bluish, purple, or black areas and extreme pain. These are symptoms of arterial obstruction that can result in loss of a limb if not immediately reversed. Do not elevate legs above the level of the heart. With arterial insufficiency, leg elevation decreases arterial blood supply to the legs. For early arterial insufficiency, encourage exercise such as walking or riding an exercise bicycle from 30 to 60 minutes per day. Exercise enhances the development of collateral circulation, strengthens muscles, and provides a sense of well-being. Keep patient warm, and have patient wear socks and shoes or sheepskin-lined slippers when mobile. Do not apply heat. Patients with arterial insufficiency complain of being constantly cold; therefore keep extremities warm to maintain vasodilation and blood supply. Heat application can easily damage ischemic tissues. Provide much attention to foot care. Refer to podiatrist if patient has a foot or nail abnormality. Ischemic feet are very vulnerable to injury; meticulous foot care can prevent further injury. If patient is overweight, encourage weight loss to decrease venous disease. Obesity is a risk factor for development of chronic venous disease. Discuss lifestyle with patient to see if occupation requires prolonged standing or sitting. These can result in chronic venous disease. If patient is mostly immobile, consult with physician regarding use of calf-high pneumatic compression device for prevention of DVT. Pneumatic compression devices can be effective in preventing deep vein thrombosis in the immobile patient. Elevate edematous legs as ordered and ensure that there is no pressure under the knee. Elevation improves venous return and helps minimize edema. Pressure under the knee limits venous circulation. Apply support hose as ordered. Wearing support hose helps decrease edema. Encourage patient to walk with support hose on and perform toe up and point flex exercises. Exercise helps increase venous return, build up collateral circulation, and strengthen the calf muscle pumps. Observe for signs of deep vein thrombosis, including pain, tenderness, swelling in the calf and thigh, and redness in the involved extremity. Thrombosis with clot formation is usually first detected as swelling of the involved leg and then as pain. Note results of D-Dimer Test. High levels of D-Dimer, a febrin degradation fragment, is found in deep vein thrombosis, pulmonary embolism, and disseminated intravascular coagulation. If DVT is present, observe for symptoms of a pulmonary embolism, especially if there is history of trauma. Fatal pulmonary embolisms have been reported in one-third of trauma patients. Discuss with patient the difference of arterial and venous insufficiency. Detailed diagnostic information clarifies clinical assessment and allows for more effective care. Educate patient about nutritional status and the importance of paying special attention to obesity, hyperlipidemia, and malnutrition. Malnutrition contributes to anemia, which further compounds the lack of oxygenation to tissues. Obese patients encounter poor circulation in adipose tissue, which can create increased hypoxia in tissue. Encourage smoking cessation. Smoking tobacco is also associated with catecholamines release resulting in vasoconstriction and ineffective tissue perfusion. Monitor for development of gangrene, venous ulceration, and symptoms of cellulitis Cellulitis often accompanies peripheral vascular disease and is related to poor tissue perfusion. Encourage change in lifestyle that could improve tissue perfusion (avoiding crossed legs at the knee when sitting, changing positions at frequent intervals, rising slowly from a supine/sitting to standing position, avoiding smoking, reducing risk factors for atherosclerosis [obesity, hypertension, dyslipidemia, inactivity]). These measures reduce venous compression/venous stasis and arterial vasoconstriction. Explain all procedures and treatments. Understanding expected events and sensations can help eliminate anxiety associated with the unknown. Teach patient to recognize the signs and symptoms that need to be reported to the nurse. Early assessment facilitates immediate treatment.